This past week my blog turned one year old. In the short period of time five Columbus breweries have either come into existence or opened public taprooms—Actual, Sideswipe, Wolf’s Ridge, Zauber and Zaftig. Three more breweries, Land Grant, Pigskin and Temperance Row, are on the verge of opening, and Columbus is still in the running to be the location of Stone’s east coast expansion. It’s an exciting time to be following the beer scene in central Ohio. Coincidentally Pat’s Pints and Wolf’s Ridge Brewing share the same birthday, and yesterday WRB threw a party to preview their soon to be open taproom. What better way to celebrate my first year of blogging than a trip down to Wolf’s Ridge to enjoy some live music and half price beers in what is shaping up to be one of the largest and most attractive taprooms in the capital city. Given the stunning fall weather, I made plans with my friends Mark and George to do a bicycle tour of several downtown breweries, the headline act being the Wolf’s Ridge taproom visit. Our first stop was Barley’s where Jim Ellison had graciously invited me to sit in on the Columbus Brew Adventures tour of Barley’s brewing (thanks Jim!). We headed downstairs at Barley’s where brewmaster Angelo Signorino, the longest serving brewmaster in Ohio, led us through samples of four beers including some classics (McLenny’s Scottish Ale, Bloodthirst Wheat) and some new experiments (Hoptoberfest, and an unusual barrel aged blend of six different beers called Uncharted Waters). It’s always interesting to hear what brewers have to say about the inspirations for their creations, and the peaceful underground room at Barley’s was a great spot for Angelo’s musings on yeast, homebrewing, and caramelizing wort. We left Barley’s around 2:45 pm and made the short ride to Wolf’s Ridge. As many people will know Wolf’s Ridge is a phenomenal restaurant, but the restaurant is so good and the bar area so small that it is often not practical to just stop in for a pint. So I have been anxiously looking forward to the day when their taproom would open. While that day is still not here, from yesterday’s preview I can confidently say it’s going to be a fantastic spot when it does open. It’s situated in a large room located on the back end of the building that houses the brewery and restaurant. 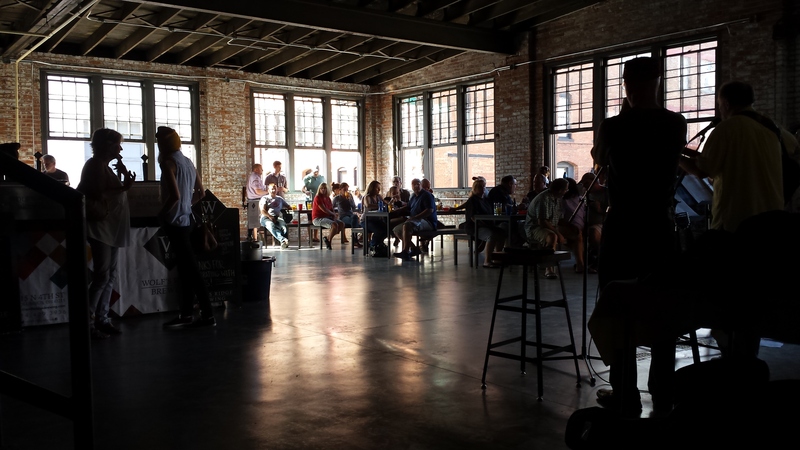 The exposed brick walls give a casual warehouse feel to the place. The outside walls are filled with tall windows and yesterday the afternoon light was streaming in, transforming the space into a cathedral for communing with the Sumerian goddess of beer, Ninkasi. An acoustic trio was playing a somewhat eclectic set of catchy music featuring selections that ranged from Dr. Hook to the Lumineers. The taproom preview at Wolf’s Ridge. We started with a pint of the Clear Sky Cream Ale. 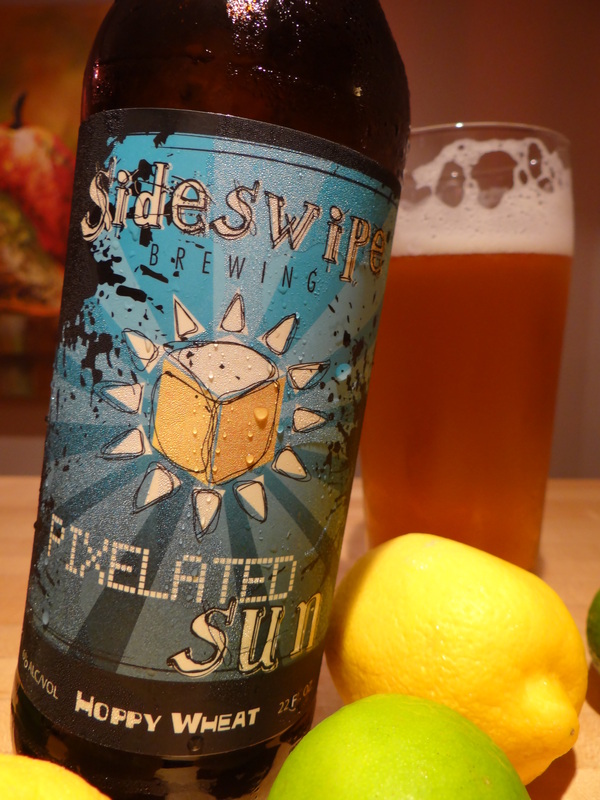 It’s unusual for one of the lightest beers in the lineup to be one of the best, but this easy drinking beer was just what the doctor ordered for three cyclists on an unusually hot late September day. If you’ve not yet tried Clear Sky do yourself a favor the next time you go down to Wolf’s Ridge and order a pint of this well-crafted, accessible beer. Next we moved onto a sample of their pumpkin ale, Pi. I’m not usually crazy about pumpkin beers and Pi didn’t do anything to change my mind on that topic. To cleanse the cinnamon from our palates we finished by sharing a pint of the session IPA, a crisp, hoppy, refreshing beer that left me thirsty for more. Since we were so close, we couldn’t resist the opportunity to make the one block trek south for our first visit to Elevator’s 13th Floor taproom, which is only open on Saturday afternoons and oddly enough is located on the ground floor. Here the vibe is very casual—kegs fitted with cushions act as the barstools, bags of malt and stainless steel fermenters are in your peripheral vision, US and Ohio maps are affixed to the back wall for visitors to mark their hometown, and nearly a dozen Elevator beers on tap. If you happen to be in the neighborhood on Saturday afternoon it’s worth a stop. 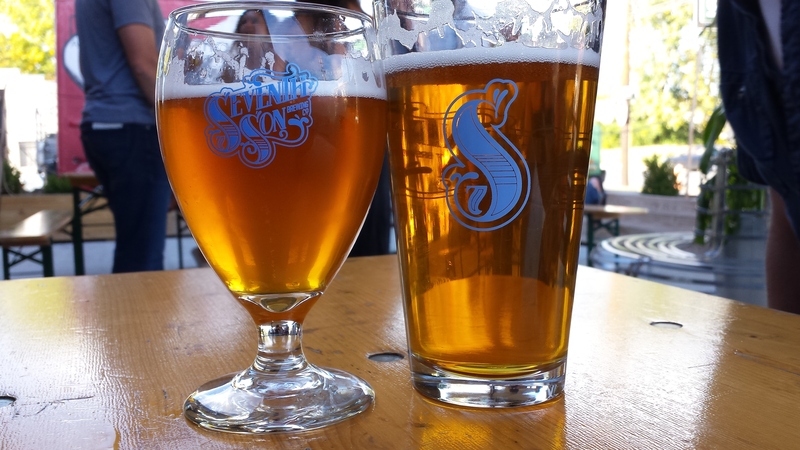 We finished our tour by stopping in at Seventh Son to share a pint of Humulus Nimbus Super Pale Ale and glass of Willowood Imperial IPA. The ride back home to Clintonville took us through the neighborhoods east of OSU just prior to kickoff of the Ohio State vs. Cincinnati football game. While it was obvious that beer was part of the celebration here, let’s just say that no one checked the reviews on RateBeer.com before they headed to the store to stock up for the pregame festivities. When I started this blog I thought it might be a fun way to connect with some friends, both near and far who share an appreciation for good beer. I had no idea that writing a beer blog would be such a fun hobby. It’s given me a reason to visit casual brewery taprooms that I might not otherwise have known existed, altered my approach to travel, motivated me to seek out new Ohio beers to review, encouraged me to slow down and appreciate each beer for its uniqueness, and afforded me the opportunity to make a number of new friends. It’s been a great experience. When I asked my wife to proofread this post she suggested I make a few edits. When I started this blog I thought it might be a fun way to connect with some friends, both near and far who share an appreciation for good beer. 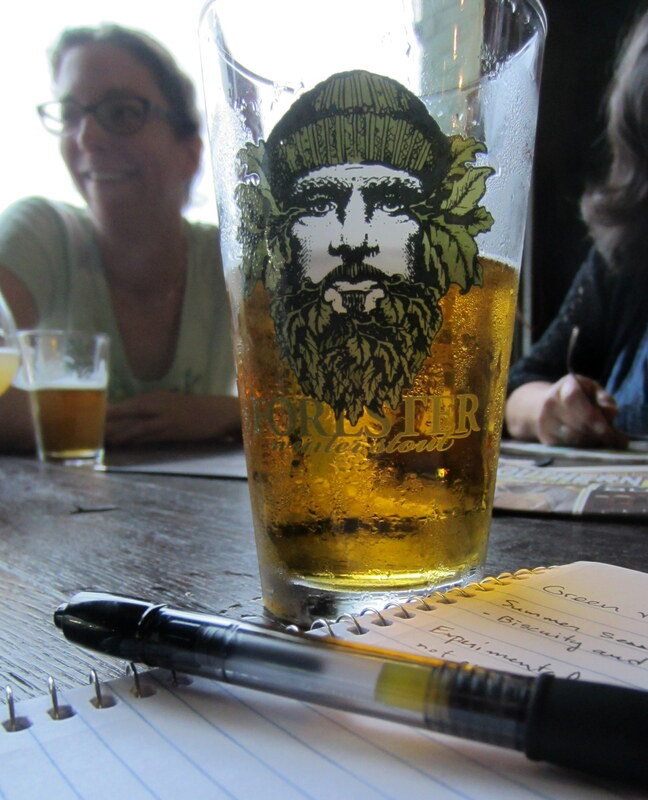 I had no idea that writing a beer blog would be such a fun hobby an unhealthy obsession. It’s given me a reason to visit casual brewery taprooms that I might not otherwise have known existed nondescript industrial spaces adorned with furniture that even Goodwill wouldn’t accept, altered my approach to travel caused us to do things like cut our visit to the Redwoods short by half a day so that we could have the “experience” of visiting Russian River Brewing, motivated me to seek out new Ohio beers to review to spend who knows how much money to keep the downstairs refrigerator stocked with enough beer to host a travelling rugby team, encouraged me to slow down and appreciate each beer for its uniqueness to take ten beer photographs for every picture I take of our children, and afforded me the opportunity to make a number of new friends given me the excuse to drink beer when I should be doing something more constructive. It’s been a great experience I can’t believe I’m still employed. In one year I’ve written 149 posts and the site has received over 20,000 hits. People (or possibly automated scripts that troll blog space and write generic comments offering great deals on programs that can write insightful blogs with no effort on my part) from over 80 countries have visited Pat’s Pints, including all but three European countries (wtf Romania, Montenegro and Moldova). I don’t have a sense how that compares to other blogs, but it has exceeded my expectations. Beer Review – 2014 Hopslam is it worth it? 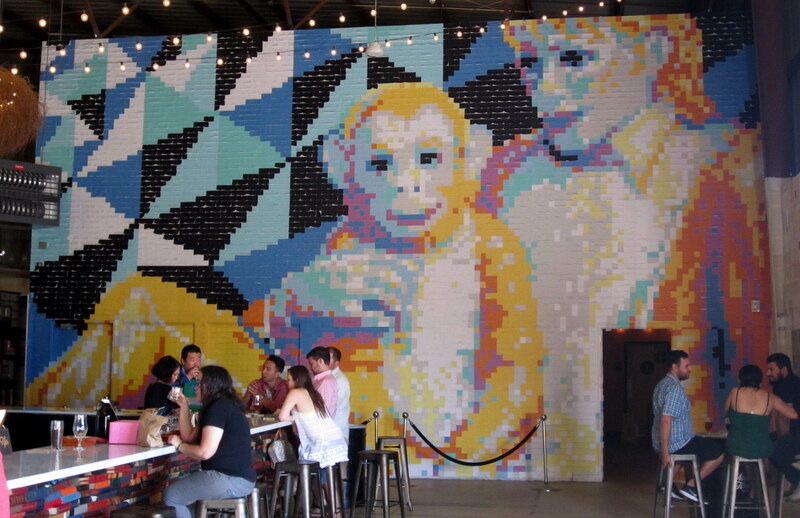 The post-it note mural at Modern Times Brewing in San Diego. Thanks to everyone who has followed the blog. Thanks to all my friends who have participated in a blind taste test, accompanied me on a brewery tour or beercation. Special thanks to the brewers who have been gracious enough to take the time out to talk to me. Thanks to Tom Aguero of Queen City Drinks for some useful advice when I started and continued support, and to Jim Ellison from Columbus Brew Adventures for introducing me to several Columbus area brewers. Most of all thanks to my wife and family for putting up with my shenanigans. I’m looking forward to another year of sudsy fun exploring the world of beer. Love the post and the wry sense of humor. Brilliant. Congrats on making it to the one-year milestone. Not many blogs can say that. Cheers! Thanks Bob. I’ve been enjoying the good work you’ve been doing with the Artful Pint. Keep up the good work. Looking forward to meeting you in about a months time. Thanks Pat. Keep up the good work. To add to the list of soon to open breweries for you to try: Temperance Row Brewery (operated by Scott Francis and his son). Expected to open….soon, Scott launched CBC, Barley’s, Barley’s Smokehouse (now Smokehouse Brewing) and many other breweries. Looking forward to celebrating our second year with your second year next September. Jim thanks for reminding me about Temperance Row in Westerville. Our cup runneth over. As an English major and sometimes beer widow, I especially liked the wifely editing. Well done! Thanks for the kind words. It’s hard to impress an English major.